13 March 2019, Kruger National Park: I stood outside of Skukuza court observing the scene. A crowd of friends and family had gathered, waiting for the two Kruger field rangers to be released on bail. When assessing the rhino crisis, it is fair judgement to say that one corrupt ranger is worse than five poachers. Saving the Wild leads the crusade against corruption; police, judges, magistrates, lawyers, all have been in our firing line, but exposing rangers turns the stomach into knots; and yet it must be done. We have a special interest in this case as the Saving the Wild intel network had these two young men on our radar as conspiring with Petros Mabuza aka “Mr Big”, the alleged Kruger kingpin arrested (with our assistance) in a Hawks Police sting operation last year. And when a man wearing a red ‘Count Pushkin’ shirt slunk up to the ranger’s legal counsel and pulled out of his pocket a huge wad of R100 notes, suddenly the air stunk of Mr Big once more. Bail was only set at R5000 each, but the money man had come prepared, for whatever it took. Inside the courtroom, senior state advocate Ansie Venter placed on record the severity of the matter; “This is a schedule one offence.” She did not oppose bail, but she did propose bail with conditions that were met. 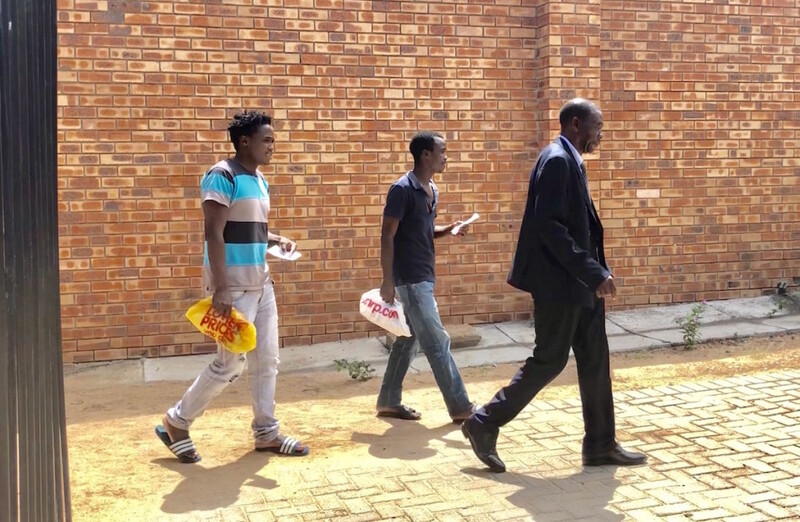 Both accused, Achieve Mlambo and Hendrick Silinda, were granted bail on condition they do not leave their home village other than to attend court or SANParks disciplinary hearings. Court was remanded to 29 April. As their families embraced their loved ones of such a savage crime, I wondered if they felt any shame. It’s not like they can claim poverty because both were employed by SANParks and earning a wage. And everyone in the crowd was well dressed, and so “I did it for my family” would be of no excuse. 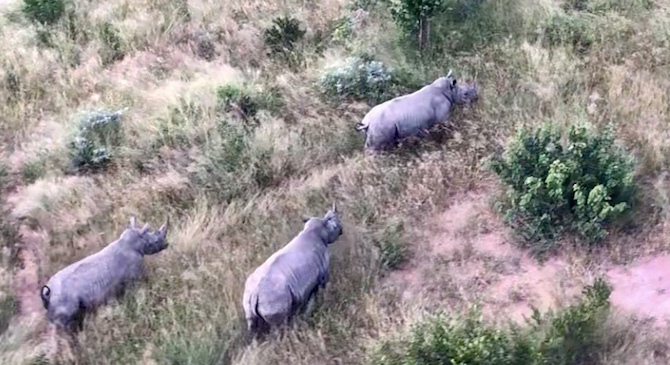 That’s the thing about rhino poaching; it’s a cycle of greed, not poverty. First it’s the new clothes and the new shoes, and soon that escalates into fast cars, drugs, prostitution, disease – and then all of this poison is injected back into the communities where they come from. As I stood alone outside of Skukuza courtroom, with at least sixty people eye balling me, I couldn’t help but feel sorry for the family in that moment Mlambo and Silinda walked out of the holding prison cells and they rushed in and embraced their “boys”. Were they raising their children to be killers, or defenders of their natural heritage? Do they believe their boys are innocent? And when the forensics evidence comes back, if their fingerprints are on the weapon of destruction, will they ask their children to seek redemption? I don’t have the answers, but I do know that we are running out of rhinos, and the domino effect on jobs in the tourism industry cannot be ignored. If they cannot feel compassion for the rhino, surely they can feel compassion for their fellow South Africans; countless families reliant on wildlife for their livelihoods. In the first court appearance, Hendrick Silinda, the skinnier and smaller of the two, wept like a baby. His colleague, Achieve Mlambo, continues to show no signs of remorse. Congratulations to Kruger for catching two rhino poachers already out on bail on Friday 15 March. From eyes in the sky, to dogs on the tracks, and field rangers sweeping the land, it really is a phenomenal team working together. Over to the courts now: We look forward to NO BAIL for repeat offenders! Durban – KwaZulu-Natal Regional Court president Eric Nzimande’s provisional suspension was confirmed during the sitting of a National Council of Provinces committee. It is alleged senior magistrates linked to a syndicate were paid to let off lightly rhino poachers, murderers and rapists. Saving the Wild Director and Activist Jamie Joseph claimed KwaZulu-Natal justice officials stuffed their pockets with cash and betrayed the sanctity of courtrooms.